I arrived in Athens shortly before midnight. An unusual sight. Most of the taxi drivers in the queue are female. My driver is a middle aged woman wearing a torn leather jacket and with no understanding of English beyond numbers. She said "yes. Liberian hotel", and she adds the name of a mysterious location that I don't understand. I show her the hotel name and address, written in both Latin and Greek alphabet. "Yes. Iberian hotel. I know where." "Not Iberian - I say patiently, pointing at the hotel name on the paper - Imperial. She says yes, and off we go. After a minute she fishes a cell phone from her jacket, and asks something. It's a flurry of incomprehensible Greek, but the hotel name I hear very clearly "yadda yadda yadda Liberia hotel yadda yadda". I lean forward and I repeat "Not Liberia. Imperial". "yes, she says. Iberia". I tell her to stop the taxi. I show her again the name of the hotel, "Imperial," and the place where it is located, "Karaiskaki". She nods vigorously and we go again. After a while, she's back on the phone, asking about "karaiskaki". According to my Athenian colleague who booked the hotel, everybody knows about this place. After yadda-yaddaying more on the phone, she gives the phone to me. A young female voice in tentative English asks for my destination. I repeat. She starts giving me directions. I remind her that I am in the back seat and she should better give these directions to the driver. I Give back the phone to the driver, and she talks for a while more. We keep going on the main highway. No mistakes so far. It's a straight drive. After a few minutes, in the same highway, she calls again, "Karaiskaki" is mentioned several times. She gives me the phone again. The distant woman asks where I am coming from. I snap that where I come from is not of big significance, and the matter of where I am going to end up has more practical and immediate value to me. The driver seems more confident now. We take an exit from the highway and she calls again. "Liberia hotel" and "karaiskaki" are definitely the topic of the conversation. I sigh and give up. If we arrive to Karaiskaki, the Imperial hotel should be there. At last, we stop in a large square. The drive says "Iberia hotel". I get out, look up at the large building in front of me. It says "Imperial hotel", and I ask for a receipt. The taxi meter reads 31 EUR, but she asks for 50, saying something that sounds like "extra charge". I refuse, and offer 30. She says 50 again, and we start to bargain. After a few minutes, we settle for 40. Welcome to Athens. The next morning, we start late. My session is delayed, but I managed to tell the MySQL story in front of an audience of about 150 people. They are a bit shy about asking questions, so I show them my MySQL 5.1. GA T-shirt, noting that the names on the back are the distribution list. If they see someone with that T-shirt, they can ask the hard questions. Both I and Salle are mentioned there, and we will welcome questions, both hard and soft, during the afternoon workshop. In the afternoon, the workshop room was prepared with about 30 seats. It is a parallel workshop, so the intention is that the few people interested in MySQL should attend the workshop, while the majority will stay in the main event. We start the workshop with about 20 people in the room, but after about five minutes, the room is invaded by the more attendees who realized late that the workshop was not in the large room. We get more than half the audience, about 70 people, packed in the workshop room. And so we start the show. We ask them what they want to hear, and this time, in the cozy illusion of comfort and camaraderie created by the small room, now crowded to capacity, the questions flow easily and friendly. 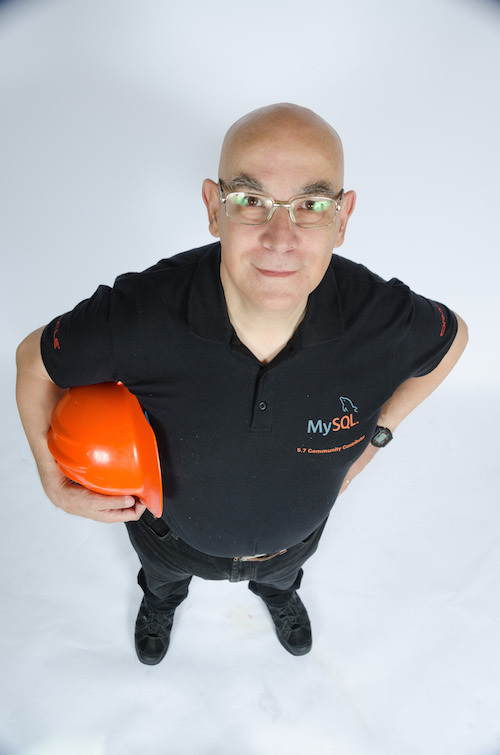 Between me and Salle, we get quickly rid of the hard questions "is MySQL Cluster the right choice for my business?" (no, unless you have a Telco-like database). "Does MySQL support load balancing?" (which leads to an explanation of what replication works, with demos. Then we dispatch the myth of Circular replication as a silver bullet scalability option, and explain how DRBD works. The scalability options are taken all into account, including the manual ones and the mythical transparent ones. We explain how MySQL Proxy works, its strength and weaknesses, and how they can play with it. A mandatory demo of how Proxy makes coffee is well received. The last topic is partitioning, and it is demonstrated with a connection to one of the community team test servers in a Norway server farm. After I show that a query that takes 30 seconds in a 741 million records non-partitioned table is reduced to 5 seconds in a table with the same records but partitioned by range, they are believers. The final applause is very much genuine and full of gratitude. 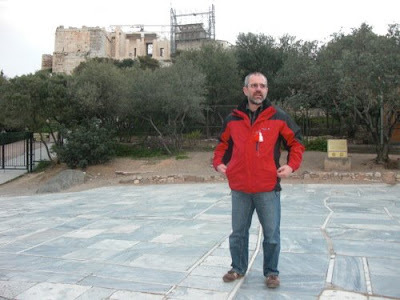 When I and Salle finally go out for a walk to the Acropolis, we feel like we have definitely been helpful. The Acropolis was closed (business hours from 8:30 to 15 only), but, hey! You can't have it all! So we ended the day in a friendly restaurant near the archaeological sites. All in all, it was a good experience. Athens deserves another visit. 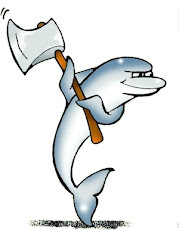 Thank you for your presentations; along with Salle you gave us quite a bite to chew-on regarding mysql.